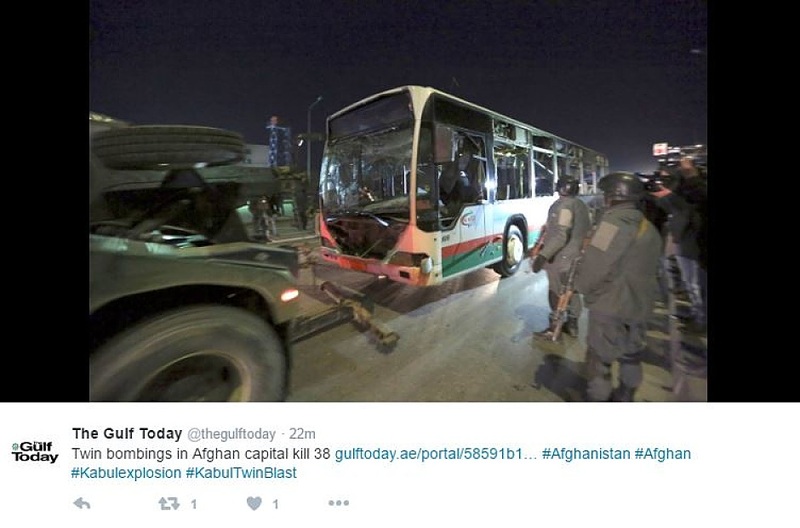 Afghan officials said at least 20 people were killed in the January 10 explosions and around 60 were wounded. Officials said the casualty figures were likely to rise. The Taliban immediately issued a statement claiming responsibility. There are conflicting reports about the incident, but at least one of the explosions was a car bomb. Afghan Interior Ministry spokesman Sadiq Sadiqi told RFE/RL's Radio Free Afghanistan that a suicide bomber blew himself up, followed by a car bomb in the same area in "what appears to have been a coordinated attack." The initial blast came at rush hour in a busy area of government offices near the Afghan parliament. The second explosion occurred after security forces had arrived at the scene. According to some reports, another vehicle with explosives was stopped by security forces near the area. The head of Istaqilal Hospital, near the scene of the bombings, told RFE/RL that more than 60 people had been brought to the hospital for treatment. Also on January 10, at least seven people were killed and six injured by a suicide-bomb attack Helmand province in the south of the country, the provincial chief of police said. The attack reportedly occurred in the house of a local tribal elder.